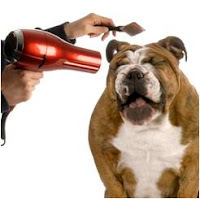 It’s one of the more dreaded tasks for many dog owners—grooming day. You give Spot a nice, cleansing bath, but he runs outside and rolls in the mud no matter the weather. And before the bath, you took the time to wrestle the beast for a nail trim and perhaps a quick shave to speed up the shedding process. All of this took a lot of effort and time, and sometimes it’s easy to talk yourself out of grooming day, especially during rainy seasons. But here’s why you shouldn’t, and how to make it easier so you don’t procrastinate so much. There’s actually a lot of benefits to grooming, otherwise known as hair brushing. It’s not just a way to make your pet look better for park day. It’s good for the coat, the skin, and his body. Brushing your dog frequently is good for his coat. It removes loose, dead hair and spreads out the natural oils in his fur that make both the skin and coat healthy. Loose hairs, when left to their own devices, tend to become matted. This leads to wads of hair that drag down the skin and causes soreness. 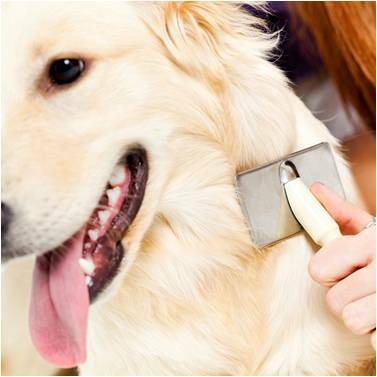 Brushing is good for the skin of your dog because it promotes good circulation. It also keeps grease levels down, which otherwise can block pores and cause sebaceous cysts. Those are some pretty solid reasons to add brushing (also referred to as grooming) to your daily routine! As the veterinary team at Nippers Corner Pet Medical Clinic will tell you, bathing your dog on a schedule based on his breed type is very beneficial. While bathing once a month is a good rule of thumb for most breeds, some can use a bath more or less often. Why? For example, breeds with an oily coat like Bassett Hounds need baths more like once a week in order to prevent blocked pores and to reduce smell. Breeds with water-resistant coats have natural oils which require less frequent bathing to preserve them. These breeds include Golden Retrievers and Great Pyrenees. And short-haired breeds (Weimaraners and Beagles) perform just fine with less frequent baths. Baths do your dog good just as brushing does. It keeps excess hair out of the coat, which prevents matting and weighing down the skin. It also keeps their coat and skin free of dirt and parasites. So take stock of your dog’s breed and start a bathing routine to suit him. Nail trimming frequency is based on a few factors. One, you should keep up with the trimming at least once a month if not more often. Dogs who spend a lot of time walking on concrete will need less frequent trims because the hard surface wears down nails. But if your dog is an indoor pet, trimming the nails every 3 or 4 weeks is the rule of thumb. One trick to keep your dog calm for this is to trim the nails right after a bath so the nails are softer. Another is to take your time—trim one nail, and if the dog is nervous, let him take a break and come back later in the day for the next nail. Have lots of treats on hand. Also avoid cutting the quick and making the nail bleed, as this experience can increase your dog’s anxiety. Follow the tips in this detailed post for a better nail trimming experience. How do you give Spot a bath? As you can see, dog grooming is an important part of a pet’s quality of life. Brush him, bathe him, and trim his nails for a happy pet. How does your grooming routine go? 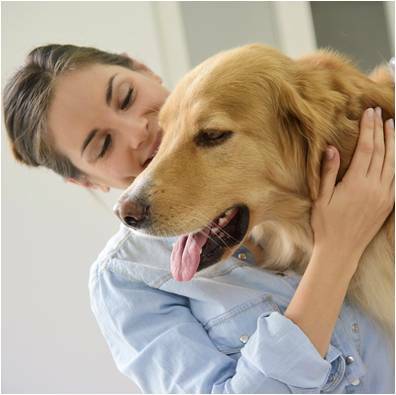 Do you keep up with daily brushing and monthly baths and nail trims? If not, are you inspired to start now? Leave us a comment about it! This article was provided by guest blogger: Sally Baggett. Sally holds a master's degree in literature and has been a copy editor and blog writer since 2009. Not only does she also teach writing at the college level, she is a busy mom to two precious little girls.